While the Despicable Me Yellow Minions make me smile, the crazy antics of the purple ones make me want to LOL (Laugh out Loud) whenever I see them running around BAAHHing! I scared my younger daughter one time, BAAHHing at her with our Funko Pop Purple Minion. Since this was one of my favorite costumes from 2013, the Purple Minion Costume was one that I wanted to get updated for the Costume Detective Collection of costume ideas. The Purple (Evil) Minions are a fun costume idea for families and for groups to dress up as for Halloween or other costume parties. 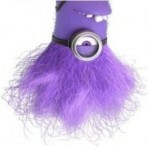 Assemble your own army of Evil Purple Minions and have fun running around like crazed, indestructible, purple creatures. There is also a separate page just for Purple Minion Makeup and Hair for the Evil Minion, since the costume page got to be too long. 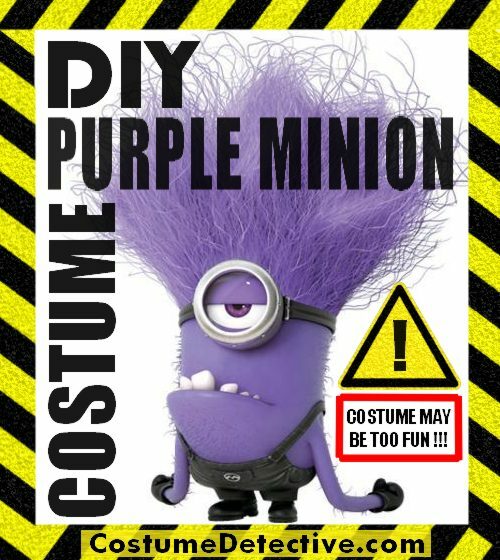 DIY Purple Minion Costume Page is the first costume page published for this site to have a free template or pattern available to download, print and use for making costumes. The El Macho Purple Minion Logo is one that I created last year when it was obvious that there weren’t any of the correct logos for the purple minion costume. I will be collecting our Free templates and patterns on this site and eventually on Pinterest. The purple minion costume was one of my favorites from 2013 and I believe it will continue to be a favorite of Despicable Me fans for many, many years.